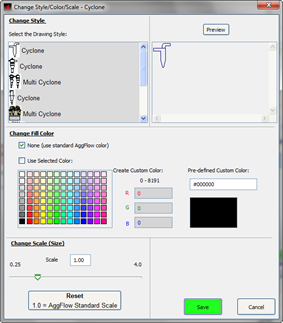 When any equipment is placed on the worksheet, select and right click to select Change Style/Color/Scale. Here you can find selections for different icons, change fill colors and rescale icon size. Use the Edit dropdown menu to align selected Icons. Use the Draw Orthogonal Flowstream button to draw straight flow lines. Select Flowlines and right click on these to straighten flowlines. Use the Notes, Coloring and Drawing selection to color flowlines and icons, draw highlight boxes on the worksheet, add custom text and add symbols. Make use of Symbols, change style, color and scale to show equipment that is part of the plant but not required for simulation calculations.